The words are those of Samuel Bamford, the weaver, writer and advocate of universal suffrage who in August 1819 witnessed first-hand what history came to know as the Peterloo massacre. The site in central Manchester where it happened, known back then as St Peter’s Field, is marked by a plaque on the wall of what was once the Free Trade Hall but is now the city’s Radisson hotel, a luxurious flophouse I mostly associate with hordes of boozing delegates at modern political party conferences. How many passersby ever look up at that tiny red circle and think about the awful day when “a peaceful rally of 60,000 pro-democracy reformers, men, women and children, was attacked by armed cavalry resulting in 15 deaths and over 600 injuries”? The massacre’s imminent 200th anniversary is already being marked by a piece of art that restores not just Peterloo’s flesh, blood and raw passions, but a vivid sense of what it says about the country where it happened, both then and now. Mike Leigh’s film Peterloo, released this Friday, is two and a half hours long and clearly a labour of love. It’s a little too heavy on clunky dialogue that makes even minor asides sound like political speeches, and so determined to cover the breadth of its story that it loses any real sense of human intimacy. But thanks to its depiction of a time of revolution, war and economic depression, its evocation of Manchester at the start of the Industrial Revolution, and its amazing staging of the massacre itself, what it says most plainly is undeniable: this mattered. I am not a huge fan of columns about other columns, but this deserves a response. Whether this country’s slow and fitful embrace of democracy originated in “the street” is a moot point, but it certainly happened thanks to the pressure exerted by an ever more engaged population, and developments that occurred far away from centres of power. People’s demands for a meaningful political voice stretched back to the great sprouting of radical and deeply egalitarian thinking that happened in and around the English civil war, and on to the ferment on this side of the channel that took root in the wake of the French Revolution: reform societies and political unions, ever-larger outdoor meetings, the large readerships that feasted on Thomas Paine’s Rights of Man and William Cobbett’s weekly Political Register. In that sense, Peterloo – the name, first written as “Peter-Loo”, was coined by the editor of a weekly paper called the Manchester Observer – does not demand attention solely because of what happened on one day, but because of a much longer story that fed into the events of 16 August 1819, and then extended beyond them. In his breathtaking book The Making of the English Working Class, EP Thompson cut to the chase: Peterloo, he wrote, “was without question a formative experience in British political and social history”. For AJP Taylor, the massacre “began the break-up of the old order in England”. Even if the response of those in power to what happened was an authoritarian crackdown that combined with an economic upswing to slow the progress of the reform movement, the massacre exposed the tangle of stupidity, patronage and corruption that passed for the country’s system of government – and began a long process of change, as an increasingly politicised working class gradually found its voice. The foundation of this newspaper– then called the Manchester Guardian, and established in the aftermath of Peterloo to “warmly advocate the cause of Reform” – is part of this story. Chartism flared to life 15 years later. Trade unions eventually began to break through in the 1850s; the expansion of the electorate was marked by the passage of legislation in 1832, 1867, 1884, 1918 and 1928. These changes may have happened at a glacial pace, but not so slowly that we can’t look beyond their datelines and identify events that set the stage: the huge meetings that happened in 1816 at Spa Fields in north London, and teetered into riots; the “reform riots” of 1831 in Bristol, Nottingham and Derby, and demonstrations around the same time in London and Birmingham; the huge Chartist gatherings at Kersal Moor, in Salford, in 1838 and 1839; the latter year’s Newport Rising. These things form a kind of shadow history of 19th-century Britain, which still has far too little purchase on this country’s shared sense of its past. Peterloo was pre-eminent among them, not least because it confirmed that reformers had an unanswerable moral case, while the authorities were exposed as the defenders of brute privilege. There is, moreover, another chronically overlooked aspect of the way August 1819 opened a path to the future: the fact that in the period leading up to the massacre, women’s reform societies had sprung up around the north-west, formed to support the fight for male suffrage, but also responsible for the innovation of women voting alongside men at radical gatherings. They attracted no end of abuse, but women reformers were defiantly on the platform at St Peter’s Field. In a just-published book about the massacre, the historical writer Jacqueline Riding says that what they did represented “the earliest example of organised female activity in British politics”. Peterloo also shines unflattering light on some of our laziest national myths. Over the past 15 years or so, we have got used to politicians describing Britain – or England – as a country that has always exuded “decency, tolerance and a sense of fair play”. By contrast, Thompson saw 1819’s carnage originating in “the panic of class hatred” and an ingrained belief that any working class crowd was always only a breath away from turning into the mob – something that has regularly surfaced long into the democratic age: witness Orgreave or Hillsborough. Another point, even more overlooked, is bound up with the same tendency of authority to tip into brutality: the fact that Peterloo saw the violence meted out by British colonialists unexpectedly returning home, and pointed ahead to some of the empire’s bloodiest episodes. 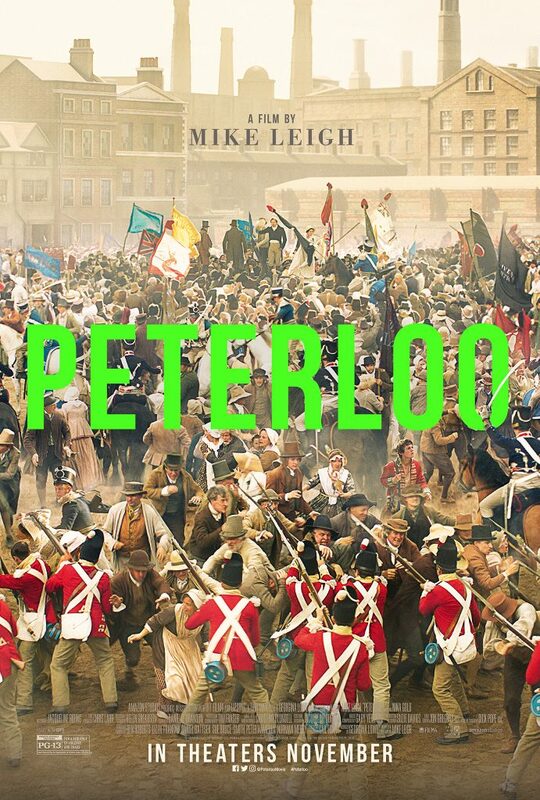 One other lesson runs through Peterloo and its legacy: the ruling class is not some phantasm of lefty demonology, but a real thing – and, even in the 21st century, its most essential features remain. Its leading lights are still hopelessly stubborn and attached to the glories of fighting the last war. As evidenced by a long story that takes in everything from the poverty of the 1930s to the Conservative party’s birthing and the bungling of Brexit, they must always get things horribly wrong before they are close to getting them even half right. Watching Leigh’s film, there was a moment when some minor character was voicing reactionary opinions with florid humbug, and I instantly pictured the former foreign secretary these days trying to sell us some half-cocked vision of our national destiny. Boris Johnson, in fact, is a creature seemingly plucked from a cartoon by the Georgian artist George Cruikshank – and a man whose infamous purchase of German water cannon while he was the mayor of London highlighted a fear of the mob that any student of the 19th century would recognise instantly. The kind of history that now seems to dominate our culture is too often centred on kings, queens and powerful men, something lately seen in the revival of the cult of Winston Churchill. Peterloo and everything that followed it were the products of things that were much more profound: disjunctions between systems of power and the new industrial economy, and the fact that among the first people to live out those contradictions and demand their resolution were the thousands who gathered in St Peter’s Field. Put another way, this country’s journey into democracy was a product of the wisdom of crowds. There, not in ministries and mansions, is where social progress always originates, and in times as uncertain as ours, we would do well to remember it.